Led by Theresa May, the Tories and the DUP have voted in favour of a parliamentary amendment to abandon the previously agreed ‘backstop’. The amendment declares that Westminster would approve a deal with the EU if the backstop, which protects Ireland from a remilitarised border across the island, is replaced with unspecified “alternative arrangements”. May’s decision to back the game-changing new policy set down by senior Tory Graham Brady is the clearest sign yet that the British government has betrayed the 1998 peace deal which ended the armed struggle of the Provisional IRA. After a year of crossing their fingers, a hopelessly naive Dublin government has finally accepted that Theresa May has welshed on the backstop, which was originally agreed in December 2017. “It’s an extraordinary situation that when a Prime Minister and a government negotiates a deal and then goes back and during the ratification process votes against their own deal, which is what happened yesterday -- and now wants to go back to their negotiating partner and change everything,” said Foreign Minister Simon Coveney. With Taoiseach Leo Varadkar left issuing warnings of a return of British soldiers to the border, Irish nationalism is once again looking across the Atlantic for support. But there are signs that Irish-America is wakening to the significance of Brexit. A resolution opposing the re-imposition of a hard border through Ireland has now been introduced in the US Congress. 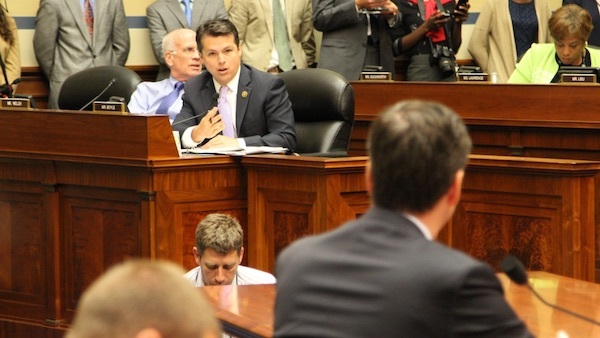 Congressman Brendan Boyle of Pennsylvania (pictured, centre) introduced the resolution on Tuesday. “One of the great foreign policy achievements of the twentieth century was the Good Friday Agreement (GFA),” he said. “Brokered by US Special Envoy George Mitchell, and agreed to by the UK, Republic of Ireland, and leading parties in Northern Ireland, it eliminated the hard border that then existed between Northern Ireland the rest of Ireland. Now Brexit threatens this. Richard Neal, the Massachusetts Congressman who was centrally involved in the Good Friday Agreement and is the co-chairman of the Friends of Ireland caucus on Capitol Hill, has recently been appointed as head of the powerful Ways and Means committee. This committee will play a key role in overseeing any future trade agreement between Britain and the United States after Britain leaves the European Union. Britain already faces being shut out of making new trade deals with the EU after it falls out of the union in March. The promise of a bilateral trade agreement between Britain and the United States is a central plank of Britain’s post-Brexit economic policy, given that British exports to the United States are worth about 100 billion pounds to the British economy. At Davos last week, Mr Varadkar was reported as saying privately that the Irish-American lobby in Congress would never allow a trade deal with the US to go through if Britain insists on reimposing its hard border.